Eastern Gorillas don’t have a large amount of interactions with other creatures which is odd considering that they live in the forest which is a heavily diverse area. The main reason gorillas don’t have many interactions with other organisms is because they very much keep to themselves. If a bird flies by they might look up or roar if it surprises them, if a reptile wanders around it’ll look at it but that’s about it, if another mammal is around it will make eye contact or maybe just look then look away. The only non-primate organism that gets any attention is the insects and that is because the gorillas are eating them. There have been some cases of leopards predating young gorillas but, it is highly uncommon. Gorillas largely keep to themselves but, when it comes to other primates especially other gorillas it’s a whole different story. Eastern Gorillas are highly social and travel in groups called troops that are led by a dominant silverback male. These troops consist of a dominant silverback, a few females, and some young males who are usually offspring. Eastern Lowland and Mountain Gorilla troop sizes average around 9-10 gorillas. These troops travel together and are led, protected, and directed y the dominant silverback. Sometimes there will be troops led by multiple males but that is highly uncommon since the males are very protective of those around them. These groups are nonterritorial and the silverback will always defend his troop over his territory. The relationships among females are relatively weak since their main objective is to find other males to mate with. In Eastern Lowland Gorillas the male leaves the natal group when mature and attracts females to him and when a dominant silverback dies the troop will search for a new leader as they often don’t have any mature males in their group. Mountain Gorillas have a similar social structure to that of the Eastern lowland Gorilla in the way that the females leave the group and find males and some males become solitary and attract females when they’re mature, they do almost everything else differently. The majority of male Mountain Gorillas stay within their group and are either allowed to mate with females or await their turn to take over when the silverback dies. If there is only one silverback in the group the females disperse and find new males when he dies. This often leads to infanticide in order to keep the young from being predated by leopards. 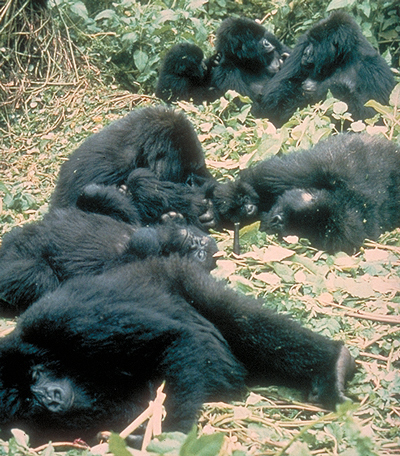 In some unstable groups the young will be killed by the new dominant silverback as a reproduction strategy. When the female dies in a group the male will take care of them and do all the things the female would including allowing them to sleep in their nest. Eastern Gorillas communicate in a variety of ways whether it is through physical movement or actual vocal sounds. Their communication is very similar to that of humans in terms of facial expressions. While they don’t have a distinct language there are certain things that are standard such as certain grunts or movement used for mating that are covered in the reproduction section of this webpage. There can be whimpers and whines during infancy and copulation, a deep purr during a period of relaxation, loud grunts and barks when signifying the whereabouts of others or giving directions, and loud whoops with chest beating when signaling danger or trying to scare away creatures. Eastern Gorillas are very peaceful and gentle but can become hostile quickly if given the wrong signal such as direct eye contact which is seen as a direct threat and a a sign of aggression.